This puzzle is like a 2×3×4 Rubik's cube. Any layer can be turned, but since they are all rectangular, only half turns will keep the puzzle in a cuboid shape. 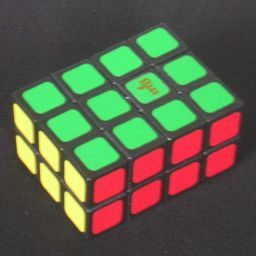 The puzzle can change shape by using quarter turns of the 2×4 sides. If you do this, then the puzzle acts like a 2×2×3 cuboid. The parts from the two outer 2×3 layers cannot be separated from its adjacent part until the shape has been changed so as to form a complete outer layer, and even then it will depend on the arrangement of the internal pieces whether the outer layer can move or not. There are two versions of the puzzle. One version has two types of internal moving parts (bandaged and unbandaged), and if they are not in the correct arrangement, one or both the outer layers are blocked from moving even if the puzzle is in the correct shape. It should be noted that if you only ever use half turns to mix the puzzle, then this situation never arises. The other version only has internal moving parts that are identical, and so cannot be in an incorrect arrangement. In this version the outer layers will always be able to move when the whole puzzle is in the correct shape. First let's assume no shape-changing takes place. The second (and the third) condition essentially means that the location of five of the pieces in the two orbits determines the locations of the other three. This gives a total of 4!6 / (2!2·3!2·4) = 331,776 positions. The outer layer extensions consist of two sets of 4 corner pieces, and a set of 4 edges. There only remains a parity constraint on the corners, So there are 4!3/2 possible permutations of these outer pieces without affecting the core cuboid. Putting it all together, the total number of positions is 8!·4!·24·4!3 / ( 23·2!2·8·2 ) = 418,037,760. If you are using the variant with two different kinds of internal pieces, then the state of those pieces should be taken into account as well. Of the 8 internal edge pieces, two are essentially fixed to the internal core. The other 6 comprise 3 bandaged and 3 unbandaged edges. These can be permuted in 6! / 3!2 = 20 ways. Therefore this version has 20 times as many states, namely 20·418,037,760 = 8,360,755,200. If you only use half turns for scrambling and solving, then it can always be solved in 14 moves or less (9.8914 on average). Hold the puzzle with a 2×4 face on top. Assuming the puzzle is in a cuboid shape, hold a 3×4 face at the front, leaving the left and right faces as 2×3. If it is not in cuboid shape, then simply look only at the middle layer, and hold it horizontal with its long side facing you. Keep in mind that you have a vertical core 2×2×3, and that all the pieces that stick out will eventually form extra layers on the left and right sides. Clockwise quarter turns of the top or bottom layer will be denoted by U and D respectively, half turns by U2 and D2, and finally counter-clockwise turns by U' and D'. For the side faces the letters F, B, L, and R represent half turns of the front, back, left and right face respectively, the latter two only having any meaning if the puzzle is in cuboid shape. Similarly, lower case letters l and r represent half turns of the vertical inner layers adjacent to the L and R face layers. I will use lL and rR to mean a half turn of the left or right half of the puzzle, regardless of whether it is in cuboid shape or not. Lastly, M2 denotes a half turn of the middle layer (like doing U2 D2 and then turning the puzzle around). Phase 1: Put the puzzle into cuboid shape. This phase is obviously not necessary if you have not used quarter turns when scrambling the puzzle. If three or more of the U layer corners stick out to the front or back, then do U. If three or more of the D layer corners stick out to the front or back, then do D.
If you still have four U/D layer corners sticking out to the front or back, then use half turns to bring at least three of them to U layer, and then do U. If you still have two U/D layer corners sticking out to the front or back, then use half turns to bring them both to U layer. Turn the U layer so that so that you have two corners sticking out to the front only. Finally, do rR U' B U B U to fix the corners. Phase 2: Find out which edge connects to the internal mechanism. This phase is not necessary if you have not used quarter turns when scrambling the puzzle. If it has changed shape during scrambling, then you should probably do this step even if your puzzle does not have internal bandaged pieces. Peek between the two front centre pieces to see the screw in the mechanisms core. Do rR, and see of the screw stays in place with the left half of the puzzle, or moves along with the right half. If it moves, then turn the puzzle around so that the left and right halves have swapped. The connected edge must now lie in the left half. 4. Do rR, and see of the screw stays in place, or moved. If it moves, then do U2. The connected edge must now lie in the left half of the top layer. It will in fact be the back-left edge of the top layer. You should now be able to do any combination of F, D2, and rR moves without the screw moving. Phase 3: Solve the internal bandaged pieces. This phase is obviously not necessary if you have not used quarter turns when scrambling the puzzle, nor if your puzzle does not have internal bandaged pieces. Hold the puzzle so that the connected edge lies at the back left of the top layer, as described in the previous phase. See if the L and R faces move freely. If so, then skip to the next phase. If the L face moves freely (and the R face does not) then do D2. If the L face still moves freely (and the R face does not) then do rR D2. The L face now cannot move, so has a bandaged internal edge at the bottom. Do D2 rR to being it to the top right, then do the move sequence D F rR F D' to insert it into the bottom front, and finally do F to bring it to the top front. The L face now cannot move, so has a bandaged internal edge at the bottom. Do D2 rR to being it to the top right, then do the move sequence D F rR F D' to insert it into the bottom front, and finally do D2 to bring it to the bottom rear. If the L face moves freely (and the R face does not) then do D2 rR D2. If the L face still moves freely (and the R face does not) then do rR D2 rR D2. The L face now cannot move, so has a bandaged internal edge at the bottom. Do D2 rR D2 to being it to the top right without disturbing the previously solved bandaged pieces, then do the move sequence D F rR F D' to insert it into the bottom front. Consider the back left edge of the top layer (the connected edge) to be solved. This edge determines the colours of the corners. Using half turns only, and without disturbing the top back left edge, solve the back left corner, so that it matches that edge. Using half turns only and without disturbing the first corner and edge (i.e. using only F, R, D2), solve the front left corner of the top layer. Using half turns only and without disturbing the first two corners (i.e. using only R, D2), solve the back right corner of the top layer. 1. Find the fourth corner, the one that belongs at the front right of the top layer. 2. Bring that corner to the front left of the bottom layer, if necessary, by doing a D2 move. 3. Do F rR D' rR U F U2 rR D rR U to insert the corner into the top face. If the side colours of the bottom four corners do not match each other, do rR U2 F U rR F U2 F U F U2 rR U. If necessary, do D2 to make the sides of the top layer corners match the bottom layer corners. Phase 5: Solve the top and bottom edges. UFl, front-left of top layer: do nothing. UBr, back-right of top layer: do nothing. If the front-right edge of the bottom layer (DFr) is incorrect, then it need to be swapped with the back-left one (DBl). Do r D2 r D2 r.
1. Find the edge that belongs at the front-right of the top layer (UFr). It will lie at DFl or DBr. 2. If it lies at DBr, do D2 to bring it to DFl. 4. Do the sequence rR U2 F U rR F U2 F U F U2 rR U, which is the same as used in step f of phase 4. 5. Repeat steps 3 and 4 once more. 6. If necessary do D2 to align the layers. Phase 6: Solve the edges of the middle layer. BL, back-left of middle layer: do nothing. FR, front-right of middle layer: M2. FL, front-left of middle layer: F M2 F.
BR, back-right of middle layer: L M2 L.
FL, front-left of middle layer: do nothing. FR, front-right of middle layer: D2 F D2 F D2 F.
BR, back-right of middle layer: R D2 F D2 F D2 F R.
If the remaining two edges need to be swapped, then do rR D2 rR D2 rR D2. Phase 7: Solve the front and back face centres. If both middle centres of the front face (i.e. uF and dF) are not the correct colour, do r M2 r M2 to fix them. Hold the puzzle such that the centre at the back left is correct. If the right centre of the front face is not correct, do F U2 r u2 F U2 r U2. If the left centre of the front face is not correct, do U2 r u2 F U2 r U2 F.